Figure 1: The antenna of Raytheons ASDR at the Logan International Airport (Boston, USA). 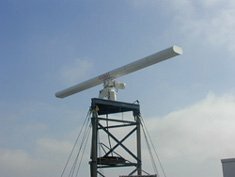 The Surface Movement Radar ASDE (Airport Surface Detection Equipment) is a high performance radar and scans the airport surface to locate the positions of aircraft and ground vehicles and displays them for air traffic controllers. Raytheons ASDE uses the Ku-Band and radiates with circular polarization. It has pulse-to-pulse frequency agility over 16 pulses. Both measures help to increase the detectability of objects in fog and rain. The ASDE radar system is a very effective tool for tracking targets on the airport surface. The main limitations are (as for all primary sensors) multipath and target identification. Installed Locations are e.g. Bombay and New Delhi.